On a subject tangetial to the topics on The Suburban Mountaineer, but quite impactful, Natalie and I are excited that our home is listed for rent and we signed a lease for a new home with more space for our family’s growing needs. We’ll miss a lot of wonderful things about our current home but the move means a dedicated space for my books and maps as well as room to finally use my hangboard. I’ll let you know how that goes after we move in a month. Now back in December I teased a little project I was working on concerning the first photographic image of K2. I love this story that I am about to start telling because it makes me feel closer to the events that helped shape our world. It also makes the people from the past become more alive. I knew the proprietor of Top of the World Books, Greg Glade. He actually reached out to me about something unrelated sometime before issue 37 came out. 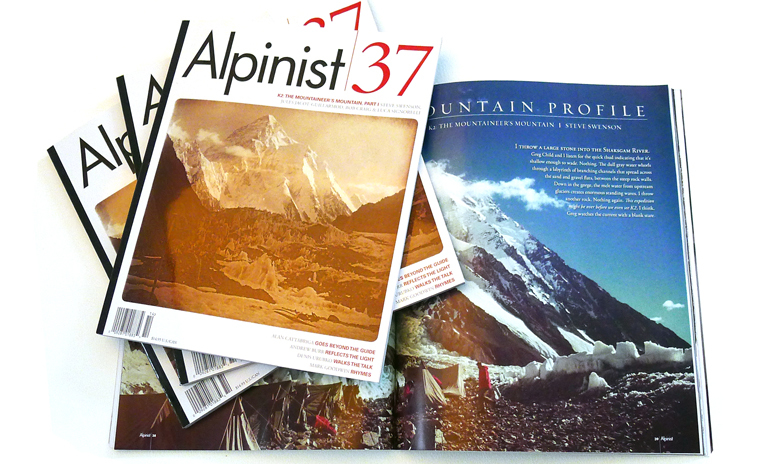 His shop is a wealthy resource of books and artifacts on mountaineering and arctic exploration. I reached out to Greg this past fall. He gave me the gist of the story, which unwrapped the reference in issue 37 a little better and he told me something the reference didn’t say; it was the very first photographic image of K2. The Himalayas and its Karakorum Range were still mostly a mystery to the majority of westerners in 1902. While the Great Trigonometric Survey estimated the heights of many of the Himalayan greats in the 1850s, the valleys and features were largely unmapped. In fact, the first western explorer in the region was Francis Younghusband in 1886-87, when he documented the way through the range via Muztagh Pass (west of K2). But the point of that route was to give the British options for military maneuvers rather than an interest in mountain exploration. Two other small expeditions of westerners visited the area around K2 in 1890 and 1892 but they were of little significance to exploring the mountain. However, these two expeditions were drawn there because K2 was the highest accessible mountain in the world. In the late 1800s and early 1900s, Mount Everest was shut off to foreigners. Both Nepal and Tibet denied access to all outsiders and so the mountaineers that were heading out from the Alps seeking greater challenges focused elsewhere in the greater Himalaya. Those that traveled there were relying on the Trigonometric Survey data from the 1850s and the little beta from Younghusband. The next two highest points became a fascination and both K2, the second highest mountain, and Kangchenjunga (28,169 ft./8,586 m.), the third highest mountain, were within British-controlled India. In 1902, Oscar Eckenstein and Aleister Crowley lead a small team to make the first attempt on K2. They pledged to climb higher than anyone had climbed previously in order to achieve the world altitude record. The team’s physician was also a photographer. Dr. Jules Jacot-Guillarmod took the first photographic image of K2 and it was published in his book Six Mois dans l’Himalaya (1904). After the mountain’s elevation recording by the Trigonometric Survey, this may have become the next piece of beta for future climbers. While I do not know for certain, I suspect the leader of the next expedition, the Duke of the Abruzzi, saw this book and this image. The Himalayas and K2 were beginning to be unmasked. It’s a bit of revisionist history, but the 1902 attempt and this photo by Jacot-Guillarmod may have been a symbolic moment for the Himalayas. The blank on the map wasn’t just replaced by contour lines but an avatar or icon. In my next post about K2’s first photograph I’ll tell you about how this image resurfaced and introduce you to an extraordinary linguist and K2 historian, Bob A. Schelfhout Aubertijn. Sources: 1) Greg Glade, Top of the World Books; 2) Katie Ives, Alpinist; 3) Bob A. Schelfhout Aubertijn; and 4) Viesturs, Ed and David Roberts, K2, 2011. Thanks for the history lesson. I did not realize Crowley was a climber, he obviously was into a little of everything wasn’t he. Looking forward to reading part 2. Crowley was a character. I didn’t know about his cult following until learning about his mountaineering expeditions. I have a theory that Oscar Eckenstein was the glue that held the K2 and Kangchenjunga expeditions together.